On this International Day of Rural Women, what I am most conscious of is how much rural women do for their families and communities. And how much more we all need to do to support them so that they can achieve improved livelihoods and food security in a way that is sustainable. “Sustainability” is a word that you hear on everyone’s lips. This past year I personally have heard it repeatedly, from the World Economic Forum to the annual summit of the G8, to the Rio+20 Conference and more recently at the African Green Revolution Forum. But how will this talk lead to real action to benefit rural women and girls — who account for more than a quarter of the global population? For the International Fund for Agricultural Development, when we talk about sustainability it is about the impact it has on rural communities. We can see sustainability embodied in rural people’s perseverance and endurance to overcome challenge after challenge and thrive doing so. More specifically, we see it personified in rural women as they are the nurturers and educators of this generation and the next. But if we are to be truly sustainable, then we must lift the heavy burden off the backs of rural women and replace it with equal access to resources and benefits, and empowerment. For rural women, sustainability means not just having enough money to put their kids in school, but to keep them there till they graduate. Being able to feed their families not just today, but tomorrow and the day after that. And for small farmers and their communities, it means adopting agricultural innovations that improve efficiency and outputs while also conserving scarce natural resources and reduce waste. Sustainability means actions that lead to hope — that the changes we make today will be the norms of tomorrow. We know that enabling women to have more equal access to economic opportunities and services is not only a matter of justice — it is also one of the most effective strategies for reducing poverty and malnutrition. Women hold the key to ensuring food and nutrition security. The numbers are convincing: production on women’s farms could increase by 20 to 30 per cent if women had the same access as men to agricultural resources such as deeds to their land, credit and technical training. With access to these resources, women could reduce the number of hungry people in the world by 100 to 150 million people. And we know, from a number of studies, that when women have greater say in how household income is spent, including the money they earn themselves, they are more likely than men to spend it on food for the family. In rural households throughout the developing world, women and girls work hard each day to protect their families’ basic rights to nutrition, health and well-being. Research shows that they comprise 43 per cent of all smallholder farmers and spend an average of 20 per cent more time than men working on agricultural and domestic chores. Yet they have far less control over the land they cultivate or the income they earn. The advancement of women is an essential prerequisite to overall development, but particularly to rural development. 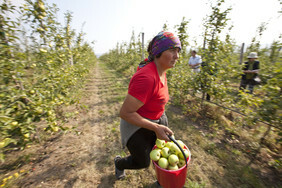 Women play a huge role in rural economies accounting for a great proportion of the agricultural labour force. If given the right support, women can also be the key to protecting our environment and natural resources. Research suggests that women express more concern for the environment and support policies that are environmentally beneficial. Evidence from 25 developed and 65 developing countries indicates that countries with higher female parliamentary representation are more likely to set aside protected land areas. Additionally, as heavy users of wood and water for their daily living, rural women have the potential to become ecosystem managers. If supported with alternative choices, they have the opportunity to ease their labour-intensive work while at the same time conserving precious resources. 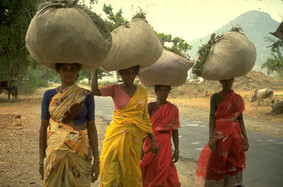 A hazardous and time-consuming task for rural women is collecting wood and its use in a smoke-filled kitchen. Labour-saving innovations like thermal-efficient cook stoves, biogas, or solar stoves not only help reduce their workload and improve their health, but also preserve our natural resource base. In many of the poorest countries, there is still an unacceptably wide gap between what women do and what they have. If we do not close this gap, we deny millions of people their engine out of poverty. We must work together to recognize women’s crucial knowledge about local ecosystems while we improve their access to agricultural resources such as seeds, fertilizers, credit as well as access to agricultural information, services and training. Beyond the farm-gate, we need to provide for their health and education needs as well. If we do, food security and protection of our planet’s resources are within reach. And that word, sustainability, and our work will have more impact, with the power of and potential of rural women behind it.